ECM broke news of the reported attack on October 9th with additional details: https://www.eastcountymagazine.org/kendrick%E2%80%99s-son-files-police-complaint-alleging-stalking-kalasho-kalasho-falsely-accuses-kendrick. ECPD also released call logs documenting numerous calls from Jesse Kendrick reporting Kalasho followed and tried to intimidate him The incident occurred while Jesse Kendrick was campaigning door to door for his father, Councilman Gary Kendrick, who is running against Kalasho in the November election. Read the ECPD call logs here from Jesse Kendrick and the process server, along with a cover letter from the city of El Cajon. ECM reporter Paul Kruze also filed a police report accusing Kalasho of threatening him with the same trained attack dog in the Parkway Plaza parking lot in July, where Kruze was photographing the Kalashos’ campaign vehicle. Kalasho and his wife, Jessica, have engaged in a pattern of defamatory posts on their social media against Kruze and East County Magazine. 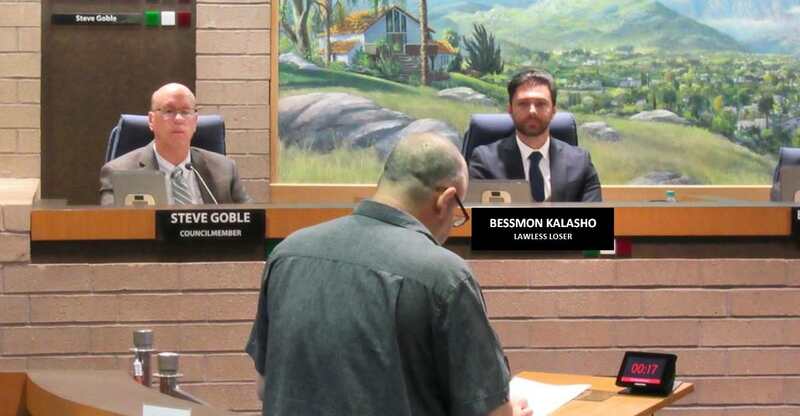 Yesterday, Jessica Kalasho posted objections on Facebook to Kruze photographing her during an El Cajon Council meeting where she was finally served legal papers, which the process server had been attempting to serve at the Kalashos’ home when the alleged threat occurred. Jessica Kalasho called Kruze a “psychopath” and falsely claimed he lacked press credentials. Kruze holds press credentials from the San Diego Police Department and multiple journalism organizations have awarded his reporting on Kalasho. Jessica Kalasho also made false insinuations regarding a $120 payment noted on Kendrick’s financial reporting to East County Magazine, implying an "agenda." In fact, the payment was to purchase two tickets to our 10-year-anniversary East County Fest. All other politicians and other guests paid for their dinners—except the Kalashos, who crashed the party without paying and left when approached by a security guard. He is that Uncle that nobody likes that still shows up at family gatherings. The public will speak at the polling booth loud and clear. WE the people are tired of bullies and members of the dark underbelly of Politics. People that use whatever perceived "Power" they acquire, to self centerdly start an agenda. The problem is, WE ARE WATCHING YOU MR. KALASHO. We hear your empty promises. We hear from women that you attempted favors from so that you will vote for them in (Of all things) a beauty contest. You are a human-wolf amongst the lambs. Uncle Ben, it's time to leave the gathering. Seems that LYING and BULLYING is normal for politicians. It's too bad really, because if not for some really stupid things they've done - and continue to do, some of the work accomplished would be good for most of us. The Kalasho's crashing the East County Fest was absolutely over the Top! No valid reason for them to attend after displaying much contempt for ECM and staff. Just a small example of how some people in positions of power or wealth display their arrogance and contempt towards others by doing - or in this case, attempting to do whatever they want! Kinda sad really. Obviously Ben isn't so tough without his trained attack K-9 with him, otherwise he would have used the dog to bully his way into the party while using verbal threats of violence. Such a joke! Wouldn't calling Paul Kruz a psychopath in a public forum constitute a type of slander? Yes. Multiple lawyers say that's actionable. It's provably false, defamatory, and malicious along with many other things they have stated. The issue is whether they will have two cents left to collect after everyone else suing them gets their money first, assuming judgments against them or settlements are eventually done. They are also accused of tryiing to hide assets through false real estate filings, which is a felony.